Politics • Love's poll has just 28% for Owens; Dem's poll gives him 44%. 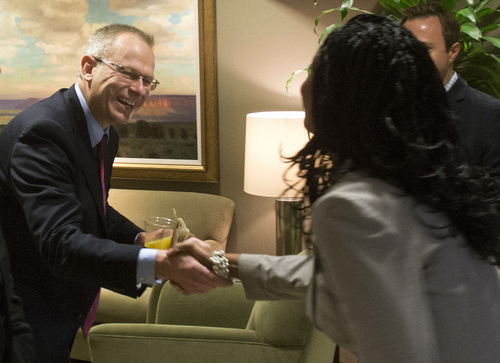 Utah&apos;s 4th Congressional District candidates released the results of separate internal polls Thursday and they reach one common conclusion  Republican Mia Love has the support of 47 percent of likely voters. The big question is how many are inclined to support Doug Owens, the Democrat in the race. Love&apos;s poll included all third-party candidates and found that 28 percent of respondents favored Owens and 24 percent either picked another candidate or were undecided. Owens&apos; poll had him with 44 percent support. It asked respondents to choose only between him and Love. So, these polls show that either Love has a big lead or it&apos;s a nail-biter. "It&apos;s a horse race and it&apos;s very winnable," Owens said. "We are within the margin of error." Love is skeptical of polls, but her campaign is happy with where they&apos;re at, and her campaign manager Dave Hansen predicts that she&apos;ll gain strength as the election approaches. An outside polling expert, who reviewed the data at the request of The Salt Lake Tribune, said both polls appear legitimate even if they came to far different conclusions. "Sounds like the truth might fall somewhere in between those two," said Scott Keeter, director of survey research at the Pew Research Center. He tends to favor polls that include third-party candidates since the format more accurately reflects what people will see when they cast their ballots, but he knows it&apos;s an issue debated within the industry. "It&apos;s too bad nobody has done an independent poll there," he said. The only independent survey took place in August, when UtahPolicy.com&apos;s poll had Love up by 12 percentage points. Internal campaign polls are not as easy to read as those commissioned by a news organization or university. Candidates tend to release the ones with favorable results and hide the ones that could hurt their cause. It&apos;s also unclear in what order questions are asked or if the respondents were given any other information that may have altered the results. "You have to be careful unless you know the polling organization, you know all the sampling information and you know the questions," University of Utah political scientist Matthew Burbank previously said. "Even when all those things line up, it&apos;s always possible that it is not a representative poll." The biggest differences between the Love and Owens polls involve how third-party candidates are treated and the percentage of voters who identify as Democrats and Republicans. The Love poll made sure that 60 percent of the respondents at least leaned Republican, believing that would match turnout in November. The Owens poll decided to peg Republican turnout at 45 percent. "I have a hard time explaining a lot about what I&apos;m seeing in their poll," said Scott Riding with Y2 Analytics, Love&apos;s pollster, which is co-owned by Hansen, her campaign manager. Owens&apos; pollster, Dave Metz, with the Democratic-firm FM3, defended his sampling and said that the key thing the polls identify is that the voters who know Owens tend to like him, a trend that gives him an opening to make up more ground in the future. Owens previously released an internal poll in July that had him 9 percentage points back. In that poll, only 21 percent of respondents had heard of him; that increased to 37 percent now. The most recent one involved 403 likely voters reached Monday and Tuesday. It had a margin of error of 4.9 percentage points. Owens, son of the late Rep. Wayne Owens, D-Utah, says he&apos;s confident in his numbers. This is the first time Love released an internal poll. It involved 500 likely voters and had a margin of error of 4.4 percentage points. Love ran for the same seat in 2012, losing narrowly to Rep. Jim Matheson, D-Utah. Her polling at the time showed her with a sizable lead and has left her skeptical of survey results. "It doesn&apos;t matter what the polls say, if your supporters are not actually going to the polls it doesn&apos;t help. I think that is the biggest thing," she told The Salt Lake Tribune&apos;s editorial board earlier this month. "I think that it is important for us to make sure we know who our voters are ... and we do everything we can to get them out." The two candidates&apos; only joint appearance thus far was at a gathering hosted by the Utah Taxpayers Association in May. They are scheduled to face each other in a debate on Tuesday at KUED, which will be streamed live at sltrib.com and air on most of Utah&apos;s television stations.